GOLDENDALE, Wash. — Here in the high desert east of the Cascades, where towering windmills quietly whir overhead, skaters hurtle downhill along a ribbon of blacktop six at a time wearing helmets and motorcycle leathers, hay bales stacked along switchbacks for the inevitable wipeouts. But in the garment district in Manhattan, it is a slightly tamer story. One day in the spring, Todd Brunengraber stepped from his office on West 39th Street. Hearing a distinct hum from newly repaved Seventh Avenue, he turned and watched a commuter on a supersize skateboard whiz by. The board was similar to the type he built in woodshop while growing up, but with big, candy-colored wheels. Soon, Brunengraber, a 62-year-old grandfather who had not set foot on a board in more than 25 years, spent $50 for a lesson and joined a growing legion of longboarders. This summer, he has been pushing to and from Penn Station, and each night after work cruising a hill on his Bay Shore, N.Y., street. “It’s a rush to get on it,” he said. Whether on a hair-raising rural road in the Pacific Northwest or in teeming Midtown traffic, longboards have become the fastest-growing segment in an otherwise sluggish skateboard market. In recent years, they have lured new participants to a pastime traditionally dominated by teenage boys and young men performing perilous stunts. “There’s a real neo-hippie, everybody-welcome kind of vibe to longboarding,” said Adam Goldstein, 43, who skates with his 10-year-old son around Manhattan. Goldstein, who directs commercials, says he takes a longboard to commute while working in Los Angeles or Toronto. “You can just go anywhere,” he said. With decks usually 34 inches or longer; trucks (axles) adapted for easier turning; and big, soft wheels, longboards provide a smoother skating experience than boards designed for performing tricks. Their size and stability make longboards well suited for cruising streets and college campuses. The price of a good longboard starts at about $150. With an inclusive, do-it-yourself ethic, longboarding has grown as a grass-roots movement mostly outside the established skateboard industry and spread from Southern California to places like Brooklyn and Bend, Ore.
Begun in a San Diego backyard in 1993 by a group of surfers, the longboard maker Sector 9 has led the way. In 2008, the surf apparel maker Billabong bought Sector 9. Sector 9 is part of an increasingly crowded market that 10 years ago was not much more than a scattered collection of small entrepreneurs. While working at a skate shop in the 1990s, Brian Petrie began making longboards from broken snowboards out of his Brooklyn apartment. The result: Earthwing Skateboards. In 2002 a group of friends in Hagerstown, Md., began building longboards for themselves. By 2004, they moved to New York and settled in Brooklyn as Bustin Boards. Zak Maytum, 19, a champion downhill and slalom skater on his longboard, began a business making wheels and bushings from his parents’ garage in Boulder, Colo., three years ago. Today, his company, Venom, employs two salespeople. “Every year is bigger than the last year,” he said. 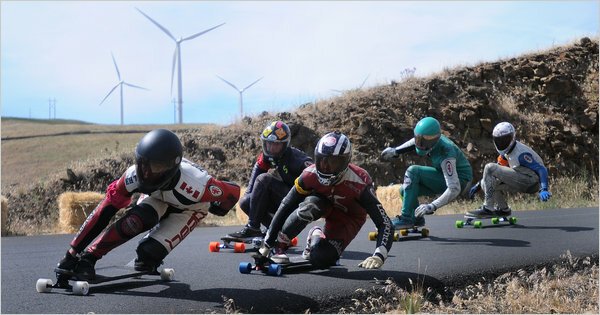 A former professional street skater, Marcus Bandy is the team manager for Orangatang, a wheel company in Los Angeles that is popular with longboarders.